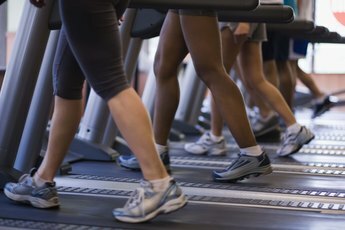 Get fit and slim with treadmill workouts. If you’re looking to lose weight before bikini season, look no further than your old friend the treadmill to shed pounds and build stamina. You might think treadmills are some kind of torture device, and they actually used to be! But they can’t be beat in terms of providing efficient calorie-burning workouts. Walking and running, as done on a treadmill, are both simple and effective forms of cardiovascular exercise. Cardio workouts are the calorie-blasters, and shed excess weight faster than anything else. 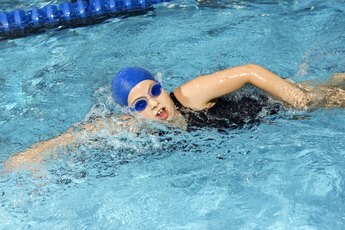 The American College of Sports Medicine recommends that healthy adults participate in cardiovascular exercise for 30 minutes at moderate intensity at least five days per week or 20 minutes of vigorous activity at least three days per week. According to a study at Harvard Medical School, walking for 30 minutes burns around 120 to 150 calories for an average woman, while 30 minutes of jogging burns about 300 to 370 calories. To lose one pound of fat per week you need to burn 500 more calories per day than you eat. 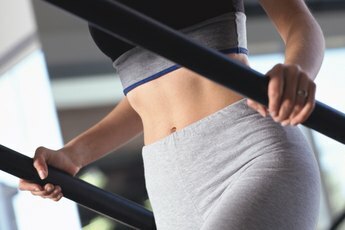 One type of treadmill workout that will kick your calorie blast into high gear is an interval workout. According to the Mayo Clinic, alternating bursts of intense activity with light activity increases calorie burn by allowing you to work at a higher intensity than normal for a longer amount of time, as a result weight loss is accelerated. Start by walking or easy jogging for five minutes to warm up. Then increase the speed of the treadmill to a pace that feels hard, but not too hard. Maintain for one minute, then go back to your walking or jogging pace for three minutes. Repeat this cycle for 20 minutes, finishing everything off with a five-minute cool-down walk. Play around with the amount of time you spend at each intensity, and don’t be afraid to challenge yourself as your fitness improves. The change-up is a workout that uses constantly changing speed and treadmill incline to rev up calorie burn while avoiding boredom. Similar to an interval workout, the change-up helps you maintain a higher intensity level for the duration of your workout, leading to a higher calorie burn than a steady-pace session. The change-up gives you total control and adds the vertical incline to the mix. According to a study done by the French National Institute of Sports, when walking or jogging on an incline, the cardiovascular system and major leg muscles are forced to work harder than usual, also leading to a greater calorie burn. Walk or jog at an easy pace for five minutes to warm up. Then for the next 20 minutes, make an adjustment to either the speed or incline of the treadmill every minute. Your workout is totally up to you -- increase and decrease gradually, or go all out. End your workout with five minutes of walking to cool down. By being in the driver's seat and constantly having to adjust, you get an effective workout that is never the same twice. While they might not be exciting, treadmills have some major pluses to consider. Since they are tucked safely inside, you can be sure to get a good workout no matter the weather. Having an indoor workout spot also keeps you from running through scary streets or busy roads, key for squeezing in an after-hours workout. To top it off, most modern treadmills have become little media stations. Depending on your home or gym set-up, you may have access to cable, movies or music -- no need to miss your favorite show to work out.